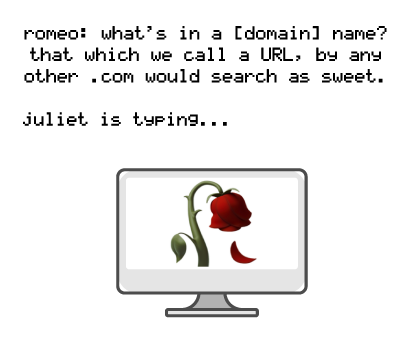 Don’t underestimate the power of the right domain name! Keep in mind this will be linked in your email signature, displayed proudly on your business cards, printed on catalogs, and well, just about any marketing materials you could ever want to make. For SEO purposes, your domain is one of the main elements search engines will consider when looking for your website. So what’s the right formula? We’ve got several options for you to explore below! Why you might want to use it for your business: If you’re a one-man-show or even a very small business where you are the epicenter of all networking and sales calls, why not make sure your clients remember your name? In fact, any other name might not be as sweet — if you are a one-person operation, you won’t want to mislead clients into thinking they’ll have multiple points of contact for their projects. Just keep ‘em coming to you. Why you might want to use it for your business: Talk about great SEO results, you’ve got search engines’ attention with that keyword-rich URL. You’ll never leave anyone wondering what the purpose of your business is and cut straight to the chase. The downside? Unfortunately, in this day and age, these generic URLs can occasionally look like spam. There’s a possibility you’ll thwart website visitors and get your email messages thrown into a junk folder. But don’t panic, this type of domain can be done right. Since you sacrifice a little specificity in the URL, you’ll just have to invest a little more in website design and brand identity to establish credibility. A super professionally designed website will send the right message and you’ll still enjoy the perks of that keyword-rich URL. Why you might want to use it for your business: These creative domains are a good middle ground between generic and completely arbitrary domains (which you’ll learn about next). Your audience will already have some sort of idea what your business is about, and you get the perks of having a unique brand identity. The catch? These clever word associations may limit your ability to expand your business offerings. So just make sure you feel secure in your future business plans or ability to manage more than one domain. Why you might want to use it for your business: The pros are the cons, here. You get a totally unique URL (likely to not already be taken!) with zero associations. You paint the canvas! But, be prepared to flex some serious branding efforts behind these! Since you’ve got a blank slate, your prospects won’t automatically know what it is that you do. You’re going to need to focus on building up your brand name with loads of self-promotion and marketing efforts to make sure it sticks with your clients. Make sure you have the time and dedication to devote to your efforts! This type of URL offers you lots of flexibility should you grow your business to include more than printing services, or more than promotional products, and so forth. Your invented name gives you the creative control to make it what you want. Why you might want to use it for your business: As we mentioned earlier, you’ll get a boost in SEO by including a keyword in your domain, but suppose you still want to include either your company name or an invented name. A hybrid domain achieves the way most users naturally search for your business — your business name and what you do. If you still want to separate your site from the pack, you can mix up your website’s extension, e.g. .net, .biz, .info, .org. SAGE Domain Registration can get your personalized URL up and running in minutes! Check to see if your name is available!